This week I got started on some log cabin spirals. I had to use both light and dark but I am making a big dent in the light fabrics. I still have so many dark blues. I was not sure how many blocks to do. 16 started so far. Not sure I will do all colours in this block. Maybe just a two colour quilt? not sure where it is going yet. It is just nice to sit and sew strips. I am using 1 1/2" strips. Look at how many different blues end up in the block so far. 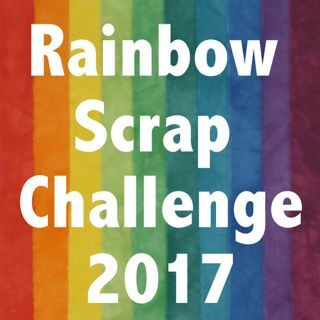 I have added this post to Soscrappy who hosts the Rainbow Scrap Challenge each Saturday. This is the block that inspired me. I got this block in the my pizza box exchange. One of my old school friends has joined the guild and is quilting too now. She made this block for me. And I just love the block. Look at these scraps. I was told about a local estate sale of fabric. I meet the gentlemen selling his wife's fabric. So sad to go and see fabric loved but not used. Well I bought some fabric and asked to take the scrap box he had. In the scrap box was a careful stack of shot cotton, all labeled with the name of the colour. Oh what a little gem of fabric. Each one has the name I had no idea there were so many shot cottons solids. I bought yardage, mostly half yards some smaller. I think these would make some great kids quilts. I might also use some in my Vintage Farm girl quilt. Shot cotton yardage I bought. The fabric was not washed and I know I will be washing those reds. They are bleeders for sure. All of the Shot cotton yardage has labels also. She had a very tidy stash. I am out at another dog trial today. My friend has asked me to come help her with her 3 dogs and would like me to run one of them. My Gemma still has a broken nail, maybe by the end of February we can play. So sad to think of a quilted stash going unloved. It is nice that you will be able to put some of it to good use. LOVE those spiral log cabins. So pretty in light and dark blue. What a find for those fabrics. Knowing they will get loved and used at your house will surely have the original owner smiling. And so wonderful that another quilters stash will live on in your projects! So pleased you bought the estate sale fabric. Good lesson for us all, use the stash don't hoard. I love your log cabin spirals! Anything really different always catches my eye. And what a great estate sale find! I bet the late seamstress would be happy to know that some of her fabric is still being loved! I love your blue spirals... a great idea for using strips. The spiral blocks are wonderful! It sounds nice to just play with strips and figure out later what's going to become of them. You got a lot of great fabric from the sale - I'm sure that quilter would be happy to know that someone else is going to love and use it! Those blue spirals are gorgeous!! I also love those spiral log cabins. So fun and a fresh idea! Love the spiral log cabin blocks - you always come up with good ideas! Your scrappy BLUE blocks turned out great and you got some lovely fabrics in that sale!! The spiral logs look great with the dark blues in there too - another sort of optical thing to look at!! Your spiral blocks are looking good. Another idea I may just have to go with one day. My list increases each time I go blog hopping!